Comprehensive step by step tutorial of how to build Ionic, Angular 5, Cordova and Firebase simple chat app. 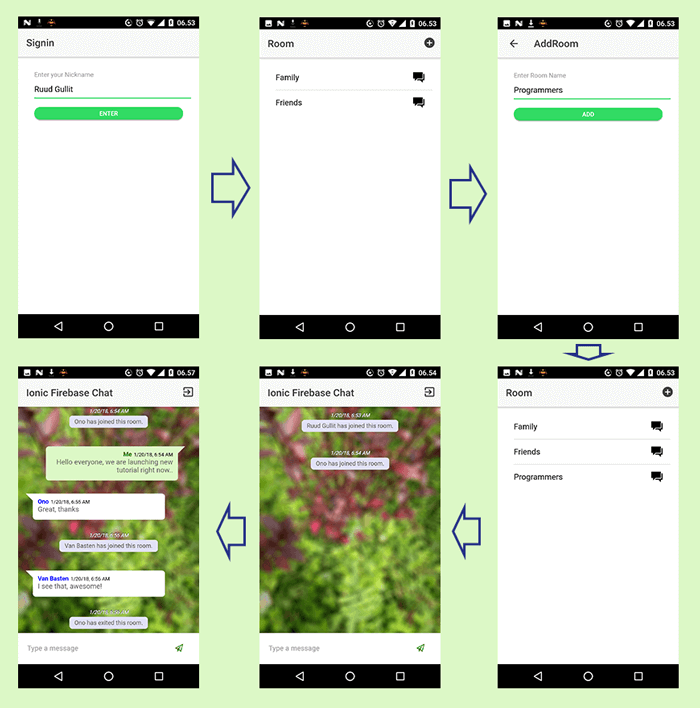 The scenario for this app is filled Nickname then save to Firebase Database, choose chat rooms from ROOM list, inside chat room type and read chat messages. This time we will use Firebase module directly instead of using AngularFire. Before moving to the steps, make sure you have installed the latest Node.js and Ionic 3. To check it, type this command in the terminal or Node.js command line. That's the last version when this tutorial was written. For update Node.js and it's `npm` download from Node.js https://nodejs.org and choose the recommended version. For Ionic 3, type this command. 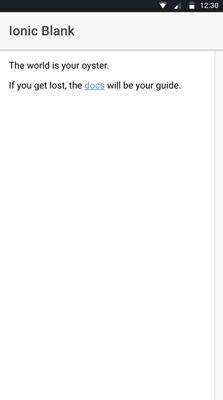 Go to https://console.firebase.google.com and log in using your google account. Click CREATE NEW PROJECT button, name it as you like (ours: GeoTracker) and choose your country. Finally, click CREATE PROJECT button. Go to Develop menu then choose Database and click Get Started button. Click RULES tab then edit to make your database writable and readable for everyone then click `PUBLISH` button. To create a new Ionic 3, Angular 5 and Cordova app, type this command. You will see this output, then type `Y` for including Cordova to the app creation.
? Creating directory ./ionic-firebase-chat - done!
? Downloading and extracting blank starter - done! Just wait for few minutes because it will also install NPM modules. Next, go to the newly created app folder. For sanitizing, run the app on the browser for the first time to make sure everything working properly. And you will see this landing page of Ionic 3 and Angular 5 app. 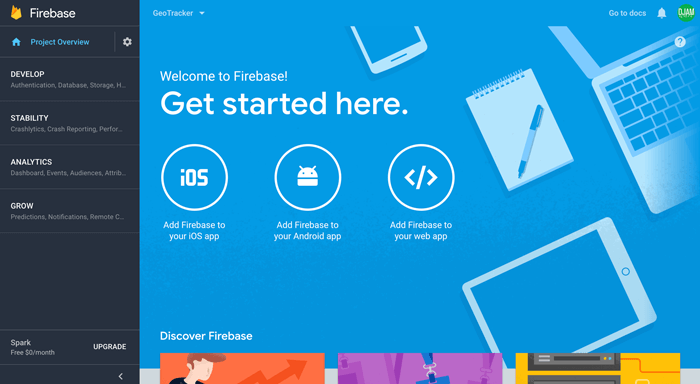 Why are we using Firebase module version 4.8.0? because it's working version right now. It seems a lot of trouble when using the version larger than 4.8.0. So be careful choosing Firebase module version, otherwise, you like to experiment with all new version by your self. Next, register the Firebase module in the Ionic 3 Angular 5 app by open and edit this file `src/app.component.ts` then add this import. Declare a constant variable for holds Firebase setting before `@Component`. Add this line inside the constructor for running the Firebase configuration. 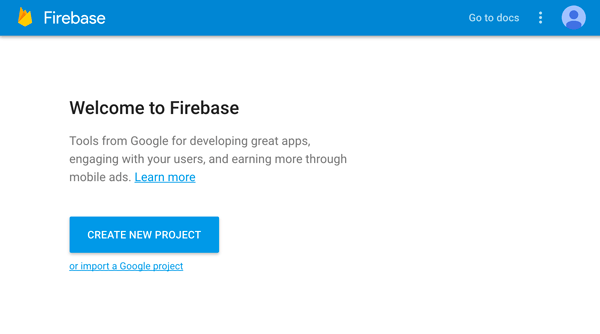 Now, Firebase database is ready to populate. To add a new page for sign in or enter a nickname, run this command. That command will create a new page bundle contains HTML, TS and SCSS files. Next, open and edit `src/pages/signin/signin.ts` then add this import. That import declares `RoomPage` that will add later. Now, add this variable before the constructor for hold sign in data. Create this function for Sign In or Enter the Room using a specific nickname. Open and edit `src/pages/signin/signin.html` then replace all tags with this. To add a new page for Room list and `add-room`, type this command. Open and edit `src/pages/room/room.ts` then replace all imports with this. Declare variables before the constructor for hold room list and referencing Firebase database. Add this Firebase function to listening any value changes from Firebase Database. Add this constant function below the Class block for converting Firebase response to an array. Add this function under the constructor for navigating to `add-room` page. Add this function for join or navigating to Home Page of selected Room. Now, open and edit `src/pages/room/room.html` then replace all tags with this. Next, open and edit `src/pages/add-room/add-room.ts` then replace all imports with this. Declare these variables before the constructor for hold data object and Firebase database reference. Add this function to the constructor for saving a new Room data to Firebase Database. Now, open and edit `src/pages/add-room/add-room.html` then replace all tags with this. Finally, we just need to modify existing Home Page for Chat page. Open and edit `src/pages/home/home.ts` then replace all imports with this. Declare content module on the first line of the Class block. Following by add these variables for hold data object, chats array, room key, nickname and status for sign out. Add this lines inside the constructor body. Create a function for sending a message that actually saves message data to Firebase database as room child. Create function for exit or sign out from the current chat room. This also sends the message for exit status to Firebase database. Next, add this constant function after the Class body for converting Firebase response to an array. Now, open and edit `src/pages/home/home.html` then replace all tags with this. To make your chat page more stylish, open and edit `src/pages/home/home.scss` then add this SCSS codes. This time to run the Ionic 3, Angular 5 and Firebase Chat app on the real devices. Before that remove/add the Cordova platform first. Now, run to the device by type this command. Then you will see the Ionic 3, Angular 5 and Firebase chat app like below. That's it, the simple Ionic 3, Angular 5, Cordova and Firebase chat app. If there are any missing steps in this tutorial you can compare with the working source codes on our GitHub.